The religious center of the world's three greatest monotheistic religions, Judaism, Christianity and Islam, Jerusalem is one of the oldest cities in the world. Ancient quarters wedge in among soaring high-rise towers and every corner and winding walkway leads to centuries of history. 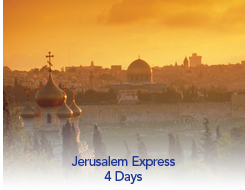 Arrive in Tel Aviv, Israel, where you are met and transferred to your hotel in Jerusalem. The remainder of the day is at leisure.